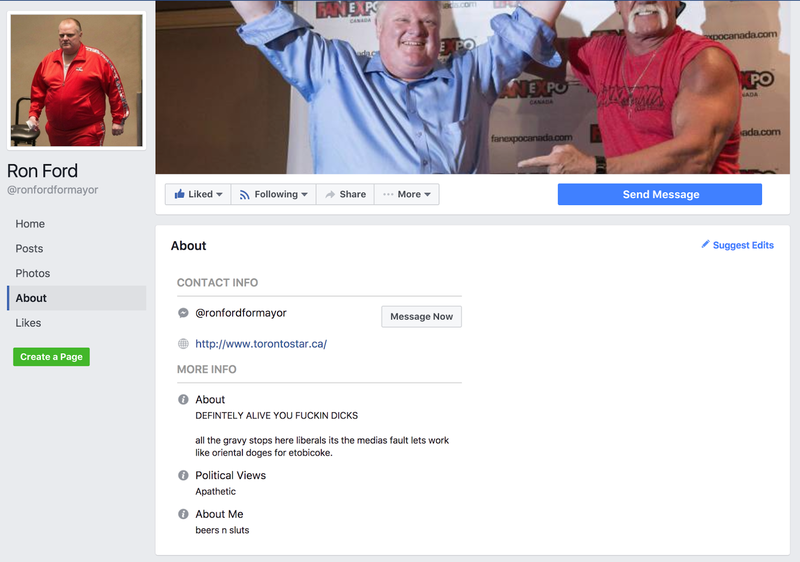 Weekly Update 2016-51: Getting back on the psychedelia train in time for the Holidays, a posthumous Facebook account from our beloved ex-mayor of Toronto, and the delectable shrinky dink keychains of Tess Reid. Did you know that there are 60s revival psychedelic pop bands in Norway? Well, there's at least one good one, and they're called Gold Celeste. If you want some soft tones to lull you to sleep, this is the music for you. I feel immediately more calm the more I listen. Check them out below, but don't operate any heavy machinery while you do! Onward rolls the blog redesign train. I've got some sketches of the blog post page to show. These were easier to make than the homepage in some ways (because they followed the predetermined pattern and also because there are fewer user goals to keep in mind), but also much more challenging because I had to think a lot more about the user experience as it relates to typography. Wires! Kinda less useful than I thought they would be with their lack of typography. It's somewhat less useful to look at wireframes of a post page, simply because the actual typography will make up the experience of the page more than the layout. So that will be my next challenge. I finished reading up about Shabbat and emailed my Chai Mitzvah mentor last night with some questions on the way Jews interact with it. I am hoping this will open a dialogue for us to discuss what it really means to be a Jew and how I can apply some sort of meaning to it. The business cards for my dad came in! Check out these bad boys. I was even proud enough to post them to social media, which I don't really do with my work. Business cards for my dad came in. Good Hanukkah present right? 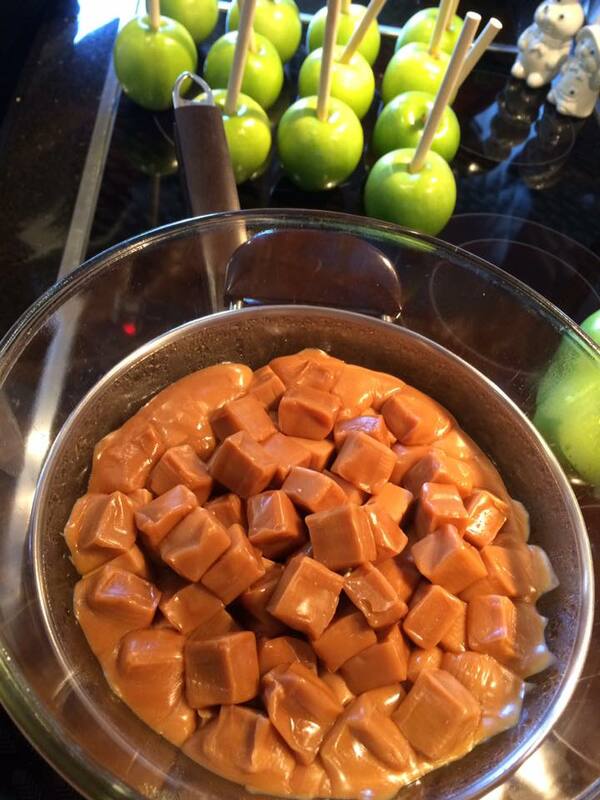 I also made fifteen caramel apples on Sunday (my arm hurts) and attended three Christmas parties last week. It might be time for a rest. Don't ask me about this last photo, taken at a friend's christmas party. I just think it's a nice family portrait. 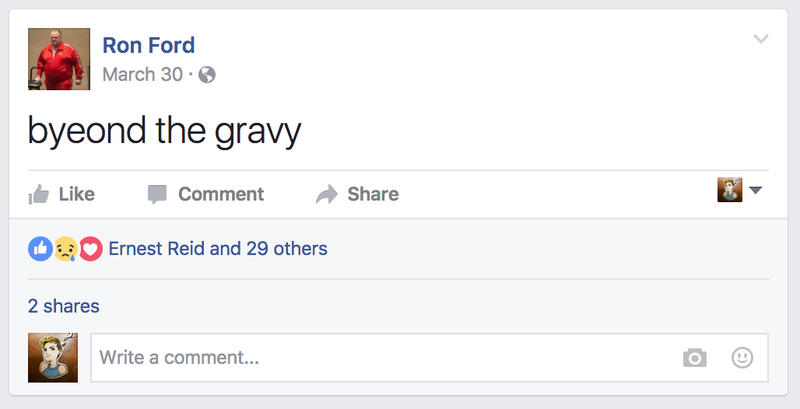 That's all you need to know. In other news, it turns out that if you complain a lot about an inferior product, the company will want to shut you up by giving you what you want. In this case, it was a brand-spanking-new pair of Dr Martens boots that originally cost $145. In my defence, the boots I had owned for only two winters were starting to leak, so I felt I was due for some sort of compensation. Now my feet won't be wet in the winter anymore! The only downside is that I have to break in a new pair of boots. My feet are already aching just thinking about it. Pray for me. This week, I am working on the typography of my blog redesign. You'll see some semblance of my process in the form of a blog post culminating my thoughts this week. I'd also like to print out a few pages of my blog in greyscale, and do a bit of markdown with a pen. I think I've already covered most of the issues with the current version, but I want to make sure I am thorough. I'd say that most of the problems stem from items that are missing more than incorrectly designed, but we'll see what comes out of it. I'd also like to finish transferring my files to the correct hard drives, organize my photo library, and backup my computer — which I haven't done since I completed a clean install of El Capitan. No, that's not a typo. 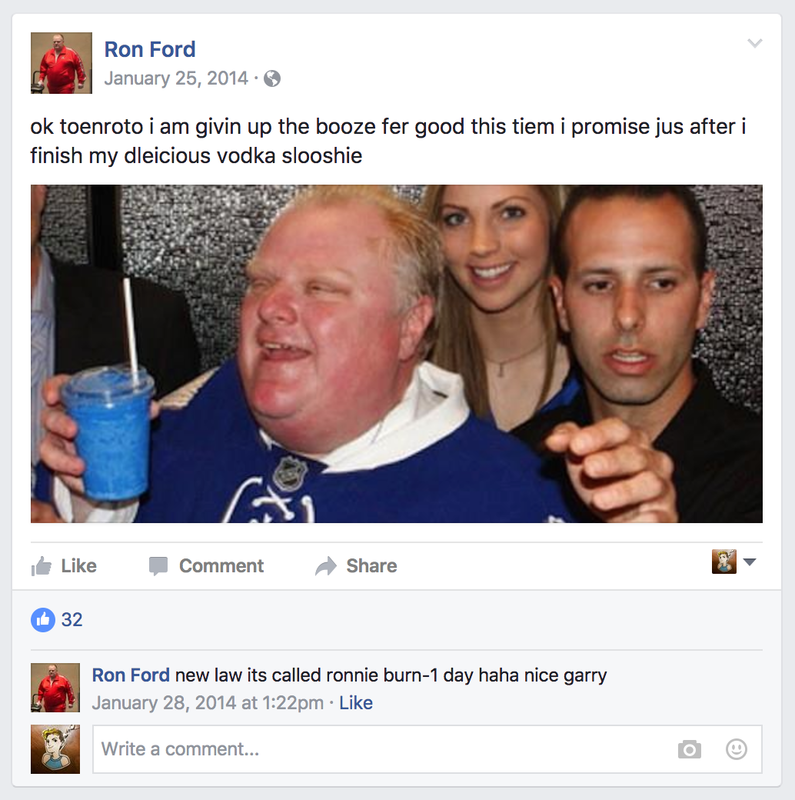 If you search through Facebook for a man named Ron Ford, you may be surprised to find that not only does this account exist, but it appears that the late ex-mayor of our fine city of Toronto is posting hilariously misspelled tidbits of drudgery from beyond the grave. 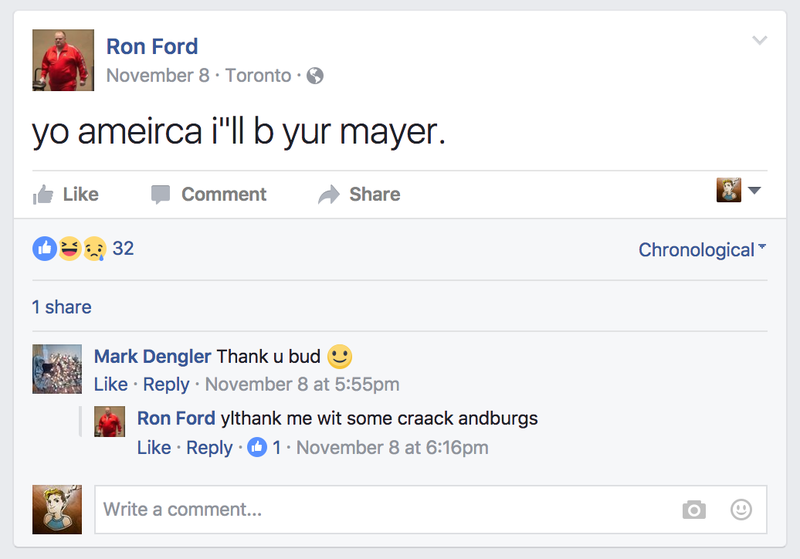 To be fair, the joke account (not actually run by or affiliated with Ford in life or death) has been around since Ford was still mayoring up the city (from 2010-2014). 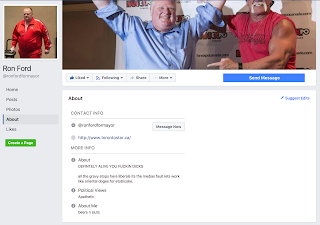 I still remember the feelings I had about him as the mayor of my city; that he was embarrassing us and basically acting like a joke. It seemed like he was drunk and partying more than actually trying to lead a city or make change. While it was really sad that we had somehow allowed this man to enter office by either voting for him or failing to vote at all (sound familiar to something that might have happened in November 2016? 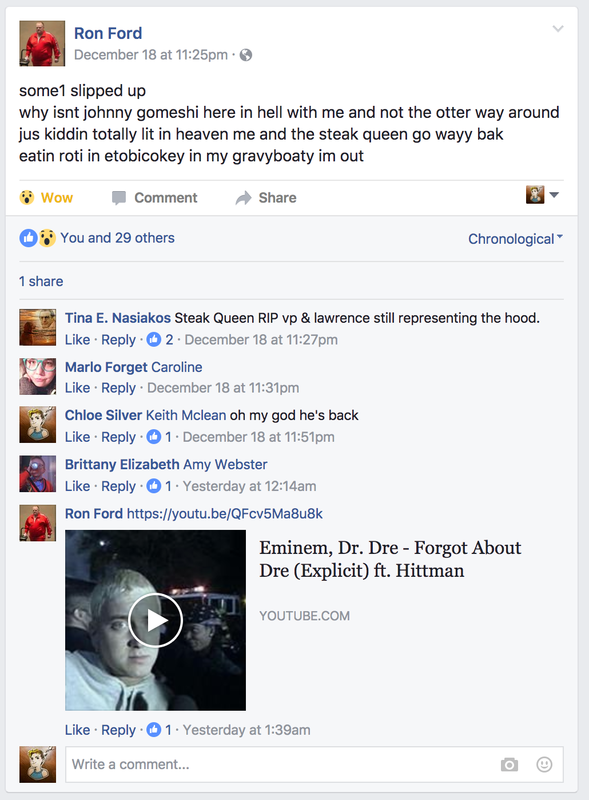 ), there was certainly also a lighter side to the ridiculous situation that made some people take a step back, sigh, and let a slight chuckle escape. 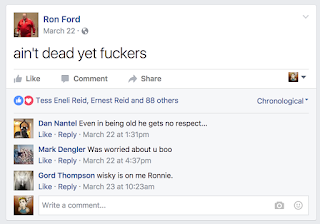 I always smiled when there was a new post from ol' Ronnie, to show me that others felt the same way about the ridiculous situation we were in. A mix of reality and fantasy: a real picture of Ford with a caption from the fake Ron. But Ford really could have said this, don't you think? 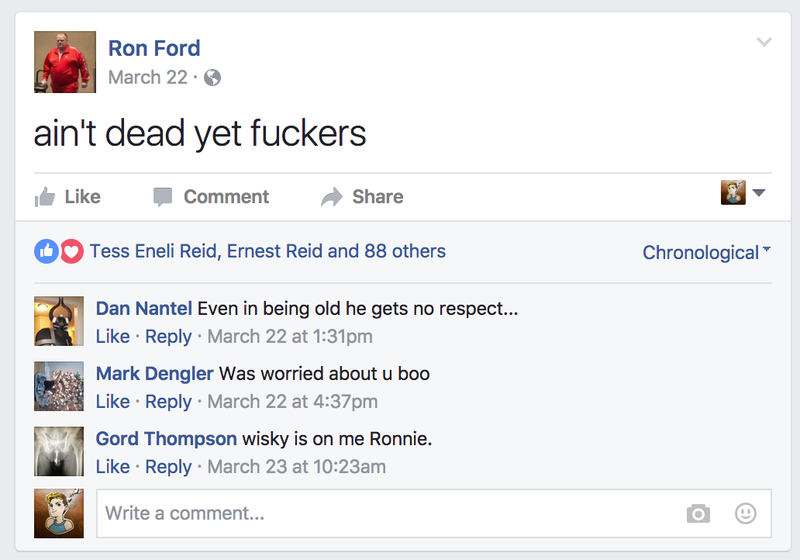 I enjoyed the way his followers would comment as well, and Ron would even comment back sometimes. Even after the death of the real Ford, Ron Ford's page remained active, often making quips on political goings-on of the day. 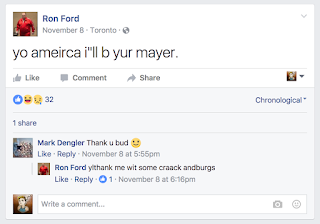 That like under my comment is from none other than Ron Ford himself. Bless you. 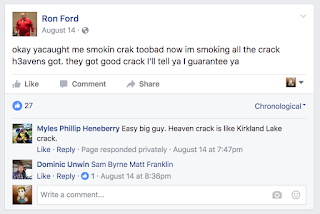 Upon my rediscovery of this wondrous piece of social media, I wondered to myself whether this was in poor taste. Sure, the guy was crazy in real life and made some terrible decisions, but have we no respect for the dead? On the other hand, he was in poor taste in life. This could also be considered in poor taste, so maybe it cancels itself out? 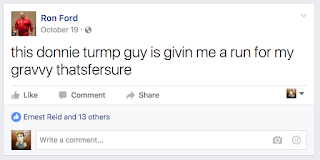 I honestly believe this account does more for his image than he ever did in life. 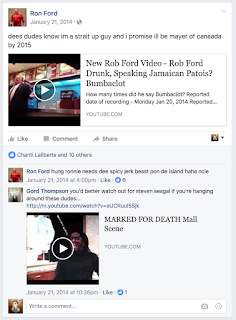 Especially the interesting posts about Donald Trump (pinko donnie) and Jian Ghomeshi (johnny gomeshi) that are quite poignant in their way. 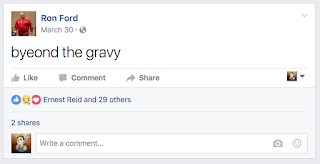 I suppose I'll keep following him, even if it is from beyond the grave (or gravy). If you attended any kind of summer camp as a kid, you'll remember that shrinky dinks were these special bits of plastic that you'd draw on, and then pop into the toaster oven to watch them wiggle and shrink down into a hard, tiny version of your original design. I still think about them every once in a while as a bit of nostalgia from my childhood. 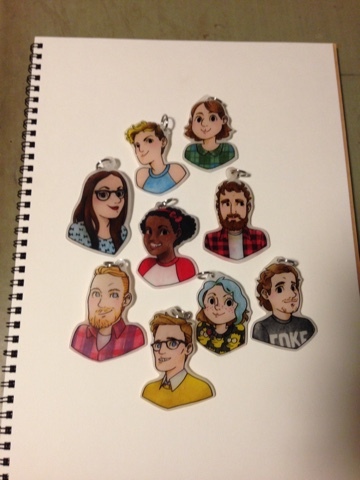 This holiday season, my extremely talented friend Tess Reid decided to draw her friends' likenesses onto shinky dink keychains as Christmas presents. First of all, who even knew that shrinky dinks still existed?! Second of all, they look AWESOME. I've managed to track down some of the others as well, which are just as great. Here is a close up of the absolutely incredible key chains the stupid taldnted @tessreid made of @keithito and I for Christmas. I feel like we look like we are in a dating Sim and that is really cool. You may remember Tess on my blog from her lovely program to honour her late mother. Tess has a way of drawing beauty out into the world (literally and figuratively), even in places where others might havesite trouble finding beauty. She is also a talented illustrator in forms including but not limited to shrinky dink art. Check out more of her work here.